the traditional long seat has been removed and a smaller one has been installed giving more space in the saloon. Inland waterways cruiser for sale in France. 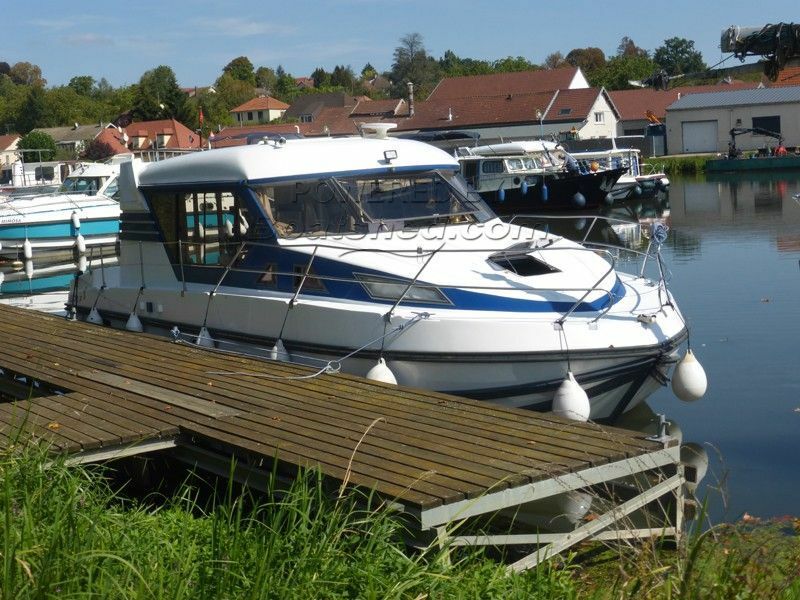 Boatshed Bourgogne is pleased to offer this river cruiser NICOLS 1000 SEDAN for sale in North Burgundy, a professionally well maintained vessel by a consciencious owner during all his ownership. You can see on our pictures that the boat is miticulously maintained even in the bilge and the few alterations made inside (removal of the huge seating in the saloon) 1 head turned into a huge shower, mixed tap, 220V sockets, has improved this well known model of Nicols and offer even more comfort for a couple who wish to cruise for long periods. This vessel will go anywhere on the inland waterways system. For more information or organise a visit, please contact Magali your local broker at Boatshed Bourgogne. This Nicols Sedan 1000 has been personally photographed and viewed by agent broker of Boatshed Bourgogne. Click here for contact details.